Two items here on chocolate. The second one pushes the age of chocolate back an additional 1500 years and as it was already mature, its likely emergence began a thousand years earlier that that even. None of it ever made it to Egypt to the best of our knowledge, although this may simply be an artifact of not looking or the unusual ways it was then used. The take home though is that its antiquity is now certain as is the growing antiquity of Mayan culture. The first item is good news. Science has woken up to the reality that we have not done nearly enough with the cocoa bean and it is time to remedy all that. Now it becomes possible to cut the fat content in half at least while loading it with vitamin C and water with no loss of quality. I have personally taken to adding a shot of cocoa powder into my tea daily in order to absorb the known benefits while avoiding the sugars and fats. It works fine. Yet it is nice to understand that reduction of fat is possible and even desirable. It is also clear that a chocolate bar is a natural carrier of large doses of vitamin C.
British chemists have used fruit juice to replace up to 50 percent of chocolate’s fat content without losing any of its tasty qualities. Working with milk, white, and dark chocolate, the researchers added minute droplets of orange and cranberry juice, less than 30 microns wide (thinner than a human hair), instead of the full amount of milk fats and cocoa butter. The new formula creates a so-called Pickering emulsion in which the tiny droplets of fruit juice remain separate and stable in both solid and molten form. “Everyone loves chocolate—but unfortunately we all know that many chocolate bars are high in fat,” said study lead author Stefan Bon at the University of Warwick in a press release. That special “chocolatey” quality is due to an ideal crystalline structure known as Polymorph V that makes chocolate smooth and glossy as well as firm and breakable. The juice-chocolate product maintains the content of Polymorph V, and storage does not lead to a sugar or fat bloom. Not surprisingly, making chocolate this way gives it a fruity taste, but this can be avoided by instead using water with a little vitamin C.
“Our study is just the starting point to healthier chocolate—we’ve established the chemistry behind this new technique, but now we’re hoping the food industry will take our method to make tasty, lower-fat chocolate bars,” Bon concluded. The findings were published in the Journal of Materials Chemistry on Aug. 8. Cacao traces found on two pieces of Mayan pottery in Mexico suggest pre-Hispanic culture may have added chocolate-flavored sauce to food like Molé. A joint research project between Mexico’s National Institute of Anthropology and History (INAH) and Millsaps College, Mississippi, revealed a specific ratio of theobromine and caffeine compounds typical of cacao in the residue. The artifacts were found at the Paso del Macho site in the Yucatan, and one of the fragments appears to be a serving plate. Dating of the residue places it between 600 and 500 B.C. 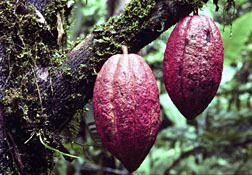 Previous evidence of cacao use has only been associated with drinking vessels, mostly in other parts of Central America, up to about 1,000 years older than the new findings. “One of the pottery shards that has been identified as having had cacao residue was not a bowl or jar, as is typical, but a plate,” said chemist Timothy J. Ward at Millsaps College in a press release. Archaeologist Thomas Gallareta Negron at INAH believes the beans were not crushed on the plate because metates or grinding stones were generally used for that purpose. Paso del Macho was a small settlement, but was probably important because it had several mounds and a ball court. The chocolate may only have been used by upper classes and priests. “This evidence combined with other archaeological, architectural, and settlement data, is providing us with a new view of this little known area of the Maya world during the earliest times,” said Gallareta Negron in the release.